Watson roadsters dominated the Indianapolis Super Speedway from 1959 to 1964. Race car builder A.J. Watson seemingly achieved perfection and brutality in one simple design. He fitted all his roadsters with an upright engine, right-justified driver positioning, torsion-bar suspension, two shocks per wheel, and a nine-foot exhaust pipe, capped by a distinctive snout. Howard Weinstein modeled the sixth Watson roadster built. 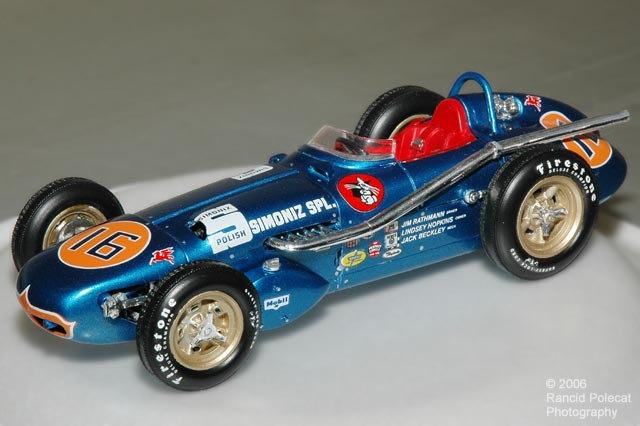 Although this car qualified at Indy every year from 1959 through 1963, it was Jim Rathman's 1959 Simoniz livery that inspired Howard to strive for his own brand of perfection.